A market is the place where buyers and sellers meet for the exchange of products. There is a mutual consent between them where the seller gives buyer the product for an agreed consideration. 1. Perfect Market: The perfect market is a kind of market in which there are many buyers and sellers. Both the buyers and sellers have the perfect knowledge about the market and each seller is selling the same product. Thus the price charged in a perfect market is always the same for everyone. There is no discrimination. The sellers are the price takers. 2. Monopoly: It is a kind of market in which there is just one seller. Being the only seller he can dominate the market. He is the price maker. There is no perfect substitute of this product. 3. Monopolistic Competition: It is a type of market in which the sellers are selling products which are slightly different from each other. It is an imperfect market where the products sold by the sellers are differentiated and are not perfect substitutes of each other. One company’s policies affect the policies of another business hugely. 4. Oligopoly: In this kind of market there are very few sellers and a large number of buyers. There is a restricted entry into the market. The policies are too sensitive in this market. Due to being closely related the competition in these markets is too high. Thus to break this vicious cycle of competition, the cartels are formed. Wish to know more about the types of markets and their planning strategies? Visit assignmenthelp.net to enhance your knowledge. Profit maximization of sellers: The profit of the sellers is maximized where the marginal costs are equal to the marginal revenue. Homogenous Product: The sellers are selling the same product. Zero Transaction Costs: There is no transaction cost as it will just raise the prices further. E.g. transportation cost. No Discrimination: Due to single price prevailing in the market, the seller cannot discriminate any buyer. Sellers are Price Takers: The sellers are not the price makers. They have to accept the price prevailing in the market. Perfect Knowledge: The buyers and sellers have the perfect knowledge about the market conditions. Wish to know about the market strategies as if how to maximize the profit? Visit assignmenthelp.net now and learn more about markets, their strategies and their graphs. The Perfect Competitive market firms always work at zero economic surplus i.e. normal profit. The profit earned in these markets is negligible. A perfect market can never earn a profit in long term because if there had been a possibility of earning profit other firms would have entered the market and reduced the profit that has to be distributed. The number of firms would have increased up till the market again started earning just the normal profit. Thus, in a perfect market the firm can earn profits only in short term. 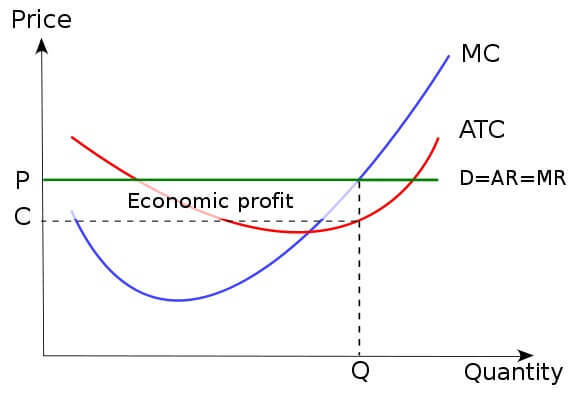 Thus in the diagram, we can see the point where maximum profit is earned is the point where the Marginal Cost meets the Marginal Revenue i.e. MR = MC. It is evident from the figure that profit cannot be made in long term. The firms will keep entering the market till the time the profit comes down to be normal. Agriculture Markets: Most of the time the agricultural markets are the perfect markets. The produce of all the farmers is the same always. They are perfect substitutes for each other. One seller can be substituted for another one. The homogenous product is there. They make normal profit. The only way to maximize the profit is to produce on economies of scale. They do not charge any extra amount and also every consumer has a perfect knowledge about the market condition and with extra media coverage the market loses any speculative chance. Thus it serves as the best example for the perfect market because in practical world the perfect market does not exist as such. Shut Down Point for a Perfect Market: The shut-down point is the point when the Revenue is less than the total cost. It is generally assumed to be the point when the Variable Costs are covered only and the fixed costs remain uncovered. In such a situation the business tends to shut down. Similarly, if the business is unable to cover its cost then it will reach the shut-down point. 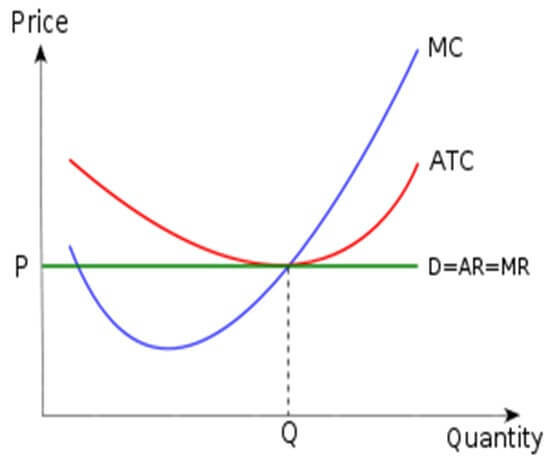 A firm’s will be in an equilibrium position where the demand curve meets the supply curve. This rule holds the same for Short-run as well as Long-run equilibrium. The difference is only that the profit earned in the long run will be normal profit only. Wish to learn more about the Perfect Markets? What are you waiting for? Log on to assignmenthelp.net now and get all your problems solved. We know how important it is for you to score good. We help you in formation of best assignments to get good marks. You can just upload your assignments online and set the deadline. We will deliver your assignment before the deadline. You can also chat with our executives who are available online and will help in tackling an issue you have. In case you have queries or doubts related to your subject the you can take online coaching as well from the best teachers we have who have professional experience in their respective fields. We guarantee the solution to all your problems. We are available 24*7 for you. What distinct us from others is our dedicated and good work. We will provide best services and you will be 100% satisfied with our services. So what are you waiting for Visit assignmenthelp.net now and avail best experiences.